USMLE questions are insanely difficult. To successfully answer them (and pass the exam), you’re going to need to engage in multi-step thinking. 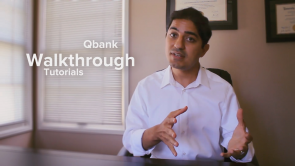 Our Qbank Walkthrough features YouTube star DocOssareh (Mohammad Hajighasemi-Ossareh, MD, MBA) who’ll teach you how to intelligently work your way through whatever type of USMLE question the examiners decide to throw at you on test day. In particular, DocOssareh will show you the different types of USMLE questions that exist and how to properly attack each one to give you the best chance of quickly coming to the right answer. For example, DocOssareh believes it’s just as important for you to read the explanations of why each wrong answer choice was wrong as it is for you to read the explanation of why the right answer choice was right. He also believes it’s vital that you spend time reviewing high-yield information relevant to each practiced question (you’ll be glad to know Lecturio has features and tools to make retrieval of relevant high-yield info a breeze). Test-taking strategies? DocOssareh’s got you covered with discussions of those too. By the time you come to the end of our Qbank Walkthrough tutorial course, you should be in position to wring every last ounce of value from the USMLE practice questions you tackle. And come test day, you’ll go in filled with confidence, ready to earn an excellent score.